Oh no! That was our initial reaction when that horrid little Playfair square appeared at the right of the grid, though we couldn’t fault the grid with its dual symmetry (and, as a fellow solver pointed out to me later, it was pangrammatic – that’s a sign of the master and a fair hint that we are dealing, here, with one of the stars) Oh no, no, no. It got worse. there was not just one Playfair code in use but a second one ‘another Playfair code phrase that is an anagram of The Bard’s Coupling and provides a hint to the theme’. Of course, we feed that into an anagram solver and get … precisely nothing. This looks ominous, as we are not going to be able to solve those eight symmetrically placed clues that are enciphered or even enter any of the other solutions to these paired difficult clues until we manage to solve two or three that intersect. Well, whoever this demon setter is, I can maybe confirm that he retains his ticket for the Listener setters’ boozy do (after all, I could hardly expel this setter could I?) but consternation. I find a drug fix, ‘…with babes during drug fix: I’m thinking “scrubby” (DUMOSE) and ‘substance’ ‘On account of substance on next page’ (OVER + LEAF), some bananas, ‘Little Welsh girl gnawed bananas’ (GWENDA) but not much wine or even beer. Then he redeems himself when we solve ‘…book sack for lags in Barlinnie’ (which we decide has to be laRK in Barlinnie) giving us GAL + RAVAGE. And what is that? Chambers tells us that it is a ‘noisy frolic’/ ‘riotous merrymaking’. Cheers ‘Mr Whoever you are’, see you at the bar! Solving was tough to say the least. GWENDA, GNUS, FUTONS, ACID, PACA and HAYLEY (I didn’t much like that clue) appeared fairly quickly, but, of course, they had to be enciphered so we couldn’t enter them and the last two of that set of eight single clues were the last two we solved. ‘Blonde bombshell backs having a cut’ DORSA less A giving us DORS. (I wonder how many younger solvers have heard of Diana Dors – though, of course, if you feed ‘Blonde bombshell’ into Wiki, she leaps to the forefront.) Then ‘Ordinary rector and Anglicans are boring’ PIE + R + CE. The definition puzzled us there and I wasn’t aware that PIE could be ordinary. Fortunately we were able to begin a grid fill with HELLWARDS intersecting with COAGULASE and GALRAVAGE and we were away. Some of the easier clues now peopled our grid: SHMO, VESPER, DIESEL, SWORDS, HEELBONE, FLEAMS and we were slowly able to build up sets of pairs of letter with which to construct the ‘other’ Playfair code that anagrammed to The Bard’s Coupling (with, of course, the letters that don’t appear there forming the last nine letters of the Playfair square). Just a hint of a theme emerged when that gave DUPLE BACON RIGHTS, and that was confirmed when VERULAMIAN appeared rising in the secondary diagonal. Who he? I ask the knowledgeable Numpty and learn that that is ‘of or relating to St Albans or Francis Bacon. Baron Verulam, Viscount St Albans (1561 – 1626)’ “Everybody knows that” he says scornfully. A red herring here! I jump to the conclusion that our unknown setter must be Trev – Mr Green of St Albans. However, the clues are there. Bacon is, in some way, our theme and here I strike lucky. We have to find the keyword in order to complete the enciphering of FUTONS and so on. Of course I resort to an on-line Playfair Cipher, I need only feed in one set of paired letters DO leading to UD in the Qinapalus tool and I am given a string of words from which DUNMOW FLITCH leaps out at me. The Dunmow Flitch is a familiar concept and vaguely ties in with the ‘Duple Bacon Rights’ of the original key phrase and more so with VERULAMIAN. I excitedly attempt to encipher FUTONS using DUNMOW FLITCH BY TREV but, of course, immediately realize that TREV cannot be our culprit as that would give two Ts. There are only two available vowels (since U O I and Y are already used) Now which setter has a short pseudonym with the letters EA? You don’t need to go to Dave Hennings’ Crossword Database to work that one out. Great setting whoever you are! Thanks. It was 8:30am on the morning of my birthday, and I was faced with a Playfair puzzle. Actually, I was faced with a double Playfair puzzle, one square consisting of the puzzle’s true title and attribution, the other using an anagram of The Bard’s Coupling, a hint at the theme. Would this be more, or less, tricky than Horvendile’s Present Day where every entry had to be Playfair-encoded. This week, the setter would only become clear once the first Playfair square had been completed. Luckily it was one where no letter recurred, which meant our mystery setter, unless he was a newbie, could be Artix, Charybdis, Ifor, Kea, Pieman, Rasputin, Sabre, Shackleton, Tiburon… the list seemed endless. 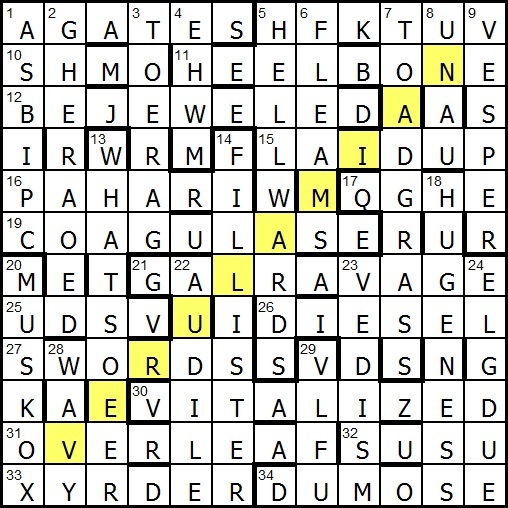 Eight answers had to be Playfair-encoded on entry using Playfair 1, and one definition in each clue pair had to have two adjacent letters decoded using Playfair 2. Before starting on the clues, I examined ‘The Bard’s Coupling’ and wondered if DOUBLE was part of the code. That left THARSCPING, but DOUBLE SR NIGHT-CAP didn’t seem to have any thematic relevance to anything I could think of. Or perhaps DUPLICATE was in there somewhere. I will start by saying that this was one tough nut to crack. Rather than describe the start of this puzzle for me (which can be summarised as ‘slow’), I’ll describe the ending (which can be summarised as ‘just as slow’). Suffice it to say that CAOGULASE and HELLWARDS helped a bit at the start, although not as much as 9-letter words normally would! After some hours solving, I finally rationalised 1ac Compare less instant backing for Stones with babes during drug fix: I’m thinking “scrubby” (6). This was almost certainly AGATES (I had the G and T — and felt like having one) but it took some time to decipher (SET AGAINST (compare) – INST)<. The remainder of the clue baffled me, although scrubby looked like it was the word that had been encoded. I was making steady progress on Square 2, and by this time I already had DU encoded as UP (duped became upped in 10,32ac), EA as UN (speaking became spunking in 16,26ac), AC becoming CO (sacred became scored, 3,23dn), and a few more besides. It took me some time to realise that Wonk’s in 12,30 became Yank’s, justifying BEJEWELED having the US single L.
I also reckoned that I was probably dealing with Kea, Pieman or Sabre as the mystery setter, the clues were that tough. I had excluded Artix due to his No Offence just last month. From the clue word encodings I mention above, DU as UP and AC as CO would give DUP and ACO in a single row or column. Perhaps I was right with DUPLICATE. With seen becoming sent at 9,20dn, that gave ENT also in a straight line, and with EA giving UN, I had the vague beginnings of Square 2 (see right). Could it become DUPLE and possibly BACON? 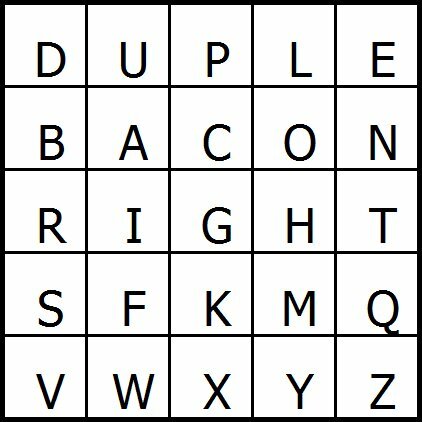 Some time later, with more clue encodings identified, I managed to complete Playfair Square 2, as shown here, although I had no idea what exactly DUPLE BACON RIGHTS could refer to. Onwards with some thoughts on 15,27 Perhaps mails special text for actor “resting” with papers of quality, wearing wrap (6; 6, two words) which looked like a simple MISSAL, although I couldn’t see any coding in text for actor. Eventually, I sussed that Perhaps mails was the definition, with foils being encoded as mails and SWORDS being the entry. And what about the second part of 1,34ac? The problem here, of course, was that I sloppily thought that Stones was the definition, and was desperately trying to decode babes as part of the definition for 34. It turned out that AGATES was definied by Stones with bands and had nothing to do with the clue to DUMOSE. I seemed to be going out of my way to make life difficult for myself! Meanwhile 7,13 Cardinalships in trouble about wheeling past all that rush with lone flayers to cant about God in Indian city (9) was such a convoluted clue that I couldn’t even guess at where the break between the two parts sat. (I guess there is a surface reading in there somewhere….) For those still in the dark, HATS (cardinalships) in WOE (trouble) + RE (wheeling, ie reversed) gave WHATSOE’ER (all that), with TOSS (cant) about D (god) in AGRA (Indian city) giving TOADGRASS (rush with lone flowers). And I can’t let 5,14dn go, Tool to make smooth cut (one that does leaning) chopped Welsh lard to heck (9). Chopped WELSH LARD for HELLWARDS was easy enough, but where was the encoding in the first part of the clue to give FILLISTER ( FIL[e] (to make smooth, cut) + LISTER (one that does leaning). That left Tool as the definition, but without any encoding. At last I realised (I think)… it was an encoded &lit, if such a thing can exist. Substitute planing and the whole clue reads as a definition, with FIL[e] (tool to make smooth, cut) + LISTER being the wordplay. This was certainly the work of a master. I managed to derive Playfair Square 1 before I had completed the grid. At 1dn, HAYLEY gave AS··PC, thus HAS were in line. 5ac FUTONS gave HF··UV, so UFH were in line, and with GNUS giving ·LFU, ASUFH had to be in line. Given NS encoded as UV, this meant that they were in line vertically. With PACA→·GHE and EY→PC (1dn), E & P were in line with A, and C & Y were in line with H. At 33ac, CE→ER, so CER were in line. I sketched out these thoughts (see right). Looking for letters that might make the bottom row, only RSV seemed to fit, so I rejigged the grid and with the E and A staring me in the face in columns 1 and 2, I knew that KEA was my nemesis. 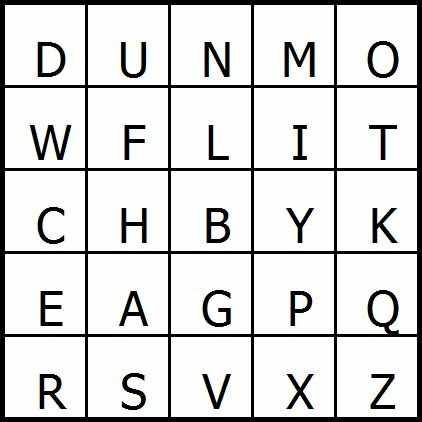 It didn’t take too long to work out the rest of the code phrase from the letters not yet used — DUNMOW FLITCH BY KEA. In Great Dunmow, this is a slab of bacon which is presented to any couple who can satisfy a Judge and Jury of 6 maidens and 6 bachelors that in a year and a day they have not wished themselves unmarried again. I guess that can be described as DUPLE BACON RIGHTS! Bizarre is the only word for that, but Phenominal is the word for this puzzle as I completed the grid a short while later. A quick highlighting of VERULAMIAN, and all was ready to go. Well, not quite. I had to rationalise the clue to VITALIZED at 30ac animated Tory Betty and Teddy. I could see LIZ (Betty) and ED (Teddy), but what Tory had anything to do with VITA (life). It was only when Goolge threw up Vita Sackville-West that I discovered that Vita was a short form of Victoria… as was Tory. News to me! Kea, thanks for the biggest headache in many a month, for a stunning concept and for the devious idea of having two Playfair code squares in a puzzle. Ill buy you a drink next time we meet (very shortly, I hope). When we saw the ceremonies and vigils to commemorate the opening of the Battle of the Somme, this morning, I commented to the other Numpty “Listener tonight – what’s the betting it is on a Somme theme!” Of course, I had forgotten that when we downloaded Tangram’s puzzle and learned that we were looking for the name of a poet and the first two lines of his poem (with a couple of words shifted into the crossword clues). Our earliest solutions suggested SEEGER to us but the only Pete Seeger verse I know is “Where have all the flowers gone …etc.” and that clearly wasn’t emerging from the letters we were omitting from our wordplay and answers. Of course I didn’t forget to confirm Tangram’s continued membership of the Merry Listener Setters’ Toping Club and he quickly reserved his ticket with ‘Drink aroused greed, but no one acted like roisterer (8 with an A removed)’ giving (SWIG less I + GREED*) SWAGGERED. Fortunately, Tangram’s taste improved as the clues progressed, culminating with ‘Good water spring; great Scotch, Elgin’s capital extra mature (4 losing a couple of Rs)’ That was more like it – a drop of the mature Scotch – though we were rather puzzled as this clue seemed to give us two sets of wordplay, assuming that ‘Good water spring’ led to G + EYE’ and that GEY = ‘great’ in Scots + E(lgin) also gave us the GEYE of GREYER (extra mature). At first sight, this crossword looked fearsome, but, in fact, the clues were relatively gentle – obviously they had to be as we were virtually cold-solving as no crossing entries totally confirmed what we assumed to be an answer, since that letter was missing from every word (surprisingly only once was it doubly missing – that R from GREYER). Words like SHADOW quickly appeared ‘Singular trouble with shade (5)’ S + ADO W(ith), and it was immediately evident that this was the word that was to be entered jumbled, as we already had the S?OD? in place. At that point, we noticed with amazement that our editors or the setter had kindly indicated for us which word was to be entered in reverse and the clue, with the hint of the letters already in place, told us to put BRINEPI[T] there, ‘Recipe in prison ruined pie; it’s full of salt (7) R in BIN + PIE*. Of course, by now, we had realized that this was not Pete Seeger but his uncle Alan Seeger who appears just above him in the ODQ and that the line of poetry was telling us, sadly that ‘I HAVE A RENDEZVOUS WITH DEATH AT SOME DISPUTED BARRICADE’ … Sure enough, there were the barricade ‘One in command runs close to barricade (5 less D)’ CO + R + [D] ON, and the Rendezvous, ‘Over a scrap in the country (5 + S)’ RE[S]ORT, so we had the third line of the poem confirmed. The ‘spring’ was returned and the ‘shade’ rustled. We completed our solve after reading that Alan Seeger did indeed not ‘fail that rendezvous’ as he died on the fourth day of the Battle of the Somme. Many thanks to Tangram for alerting us to this poet and poem on the hundredth anniversary of that dreadful event. This week, we had Tangram’s third Listener, his second being three year’s ago and based on The Listeners by Walter de la Mare. That was a Letters Latent puzzle, and so was this. Here we had to identify a poem, with the latent letters spelling out its first two lines, with two words missing and supplied by an extra word in each of two clues. One row would contain two entries which cryptically represented the poem’s third line. 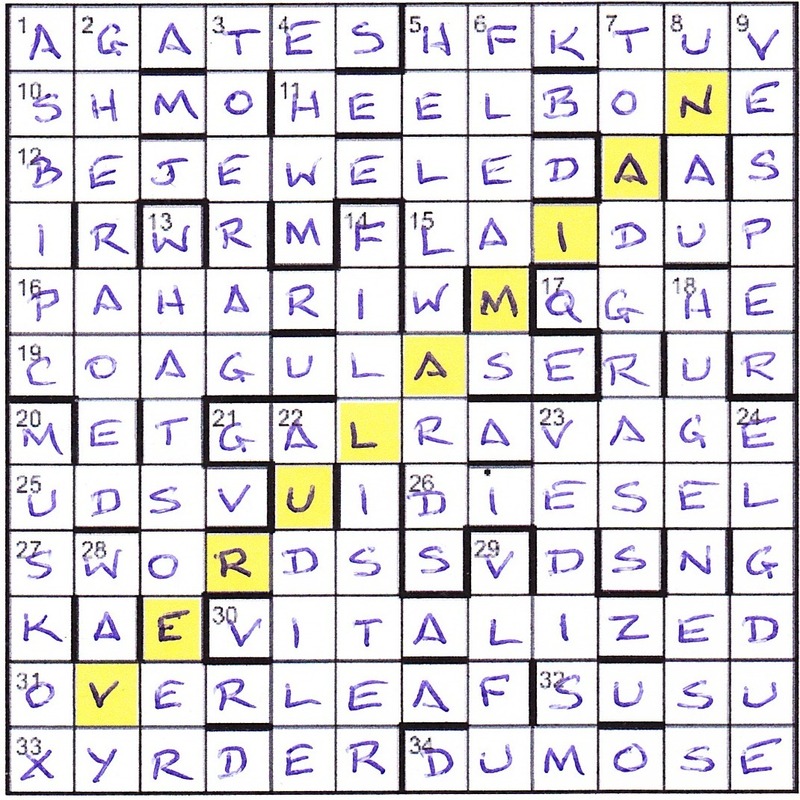 My first pass through the clues — and a couple of minutes more — gave me the best part of a score of entries in the grid. These included DECAS[T]ERE and EMUL[A]TOR across, and CHICK P[E]A, [P]ORKIEST and PT[E]RANODON down. Consequently, I had a nice smattering of entries in the grid, and this enabled solving to continue reasonably smoothly. Two clues needed careful analysis, initially seeming too verbose. 9dn Manner of dress pains older adolescent, it’s said (4) was a definition of TENUE (manner of dress) and two wordplays, TENE (pains) and a homophone for TEEN (older adolescent). 28dn Good water spring, great Scotch, Elgin’s capital extra mature (4) was similar with G + EYE and GEY + E both being the wordplay with GREYER being defined by extra mature. It’s always entertaining to have an LL clue where more than one of the required letter is omitted from the full word, GREYER being the only one in this puzzle. However, it is a credit to any setter to be able to have the latent letters spell out the required quotation in the order of the clues, so I just had to make do with GREYER. I was very late in solving 1ac and 2dn. At 1ac Church engaged in quiet opening part of liturgy (6), I was trying to get a variation of SHACHARIS to fit, a word given by Mrs B, but not in Chambers (so why I spent so much time on it is a mystery). ST[I]CHOS was, of course, the correct entry. TERES MAJOR at 2dn was an obvious anagram of Jar stereo plus M to give TERES MAJOR, but that was new to me (and I refused to cheat). Meanwhile row 10 had BRINE-PI[T] entered backwards and S[H]ADOW entered jumbled, but their exact relevance to the poem still had to be discovered — mainly because the poem was still a mystery. Anyway, the quotation and poet were finally revealed: I have a rendezvous with death at some disputed barricade. A Seeger. Barricade and rendezvous were superfluous words in 24ac and 7dn respectively. Line three was “When Spring comes back with rustling shade” and was represented by BRINE-PI[T] (salt spring) reversed and S[H]ADOW (shade) jumbled. Thanks to Tangram for a well-crafted puzzle and for helping me experience another poet’s view of the War, poignant and haunting. This crossword started life as one themed on the works of the celebrated Arts & Crafts architect, Sir Edwin Lutyens. I admire nearly all of his work, from his “simple” private houses to Viceroy’s House in New Delhi which still takes my breath away. Perhaps the only property of his which fails to impress is sombre, leaky Castle Drogo, where his clients overruled him on almost all the important matters. In the course of my research I became increasingly sidetracked by Lutyen’s father-in-law, Edward Robert Bulwer-Lytton, 1st Earl of Lytton, a career diplomat who was also a poet and novelist, writing under the nom de plume of Owen Meredith. The pinnacle of Lytton’s diplomatic career came in 1876 when he was appointed Viceroy of India. In 1880 the 2nd Anglo-Afghan War brought down Disraeli’s administration and Lytton resigned. After spending a few years away from diplomatic circles, he took up the position of Ambassador in Paris in 1887. He was so revered there that, on his death in 1891, the French gave him a state funeral. His poem, Lucile, was written in 1860, the relevant part of which seemed to me to have Listener potential. Though I don’t share his sentiments, in one verse he lists seven things we can do without and just one essential, namely cooks. Perhaps this is why the French adored him so much. 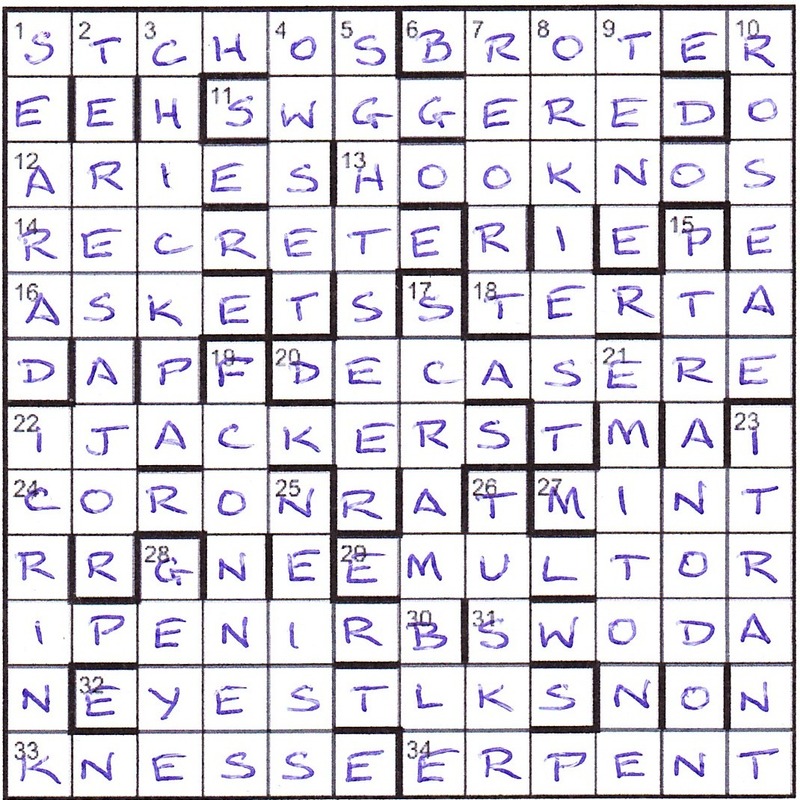 To stick to the theme, it seemed natural that there should be an unnecessary letter in each clue, not entered in the grid, spelling out all bar one of the unnecessary items. The last one, heart, was provided by the mildly cryptic title. One of his unnecessary items, books, differs from cooks by only one letter, which suggested having a clash in that cell. Solvers had to choose cooks (essential) in favour of books (inessential) in line with the sentiment of the poem. Four more clashes in the grid had to be resolved to yield LYTTON (the author) and LUCILE (the title of his poem). In my original submission, I simply said that all clashes had to be resolved thematically, but the Editors felt that it didn’t make the cooks/books choice sufficiently clear and changed the preamble accordingly. My previous Listener was rightly slated by many for the simplicity of its clues. Although there were a few easy clues provided this time to get solvers started, I hope some of the clues proved a tad meatier. Also solvers of my previous Listener commented that it was far too easy to spot the theme. This time “Lytton”, once discovered, has some ambiguity, as Lytton’s father was also a writer as was Lytton Strachey. Had “Meredith” appeared anywhere in the puzzle, I’m sure the theme would have been discovered disappointingly early. Because many of us travel a lot and must rely on the Internet for thematic information, I provided an alternative pathway into the theme by asking solvers to shade VICEROY, which was placed in a prominent position in the grid. Thank you for the many kind comments that I’ve received since publication of Listener 4404. As a novice setter, I also value adverse comments. In future I’ll probably never use the “extra letter in wordplay” device and I’ll always check that any quotation involved appears in the current edition of ODQ.